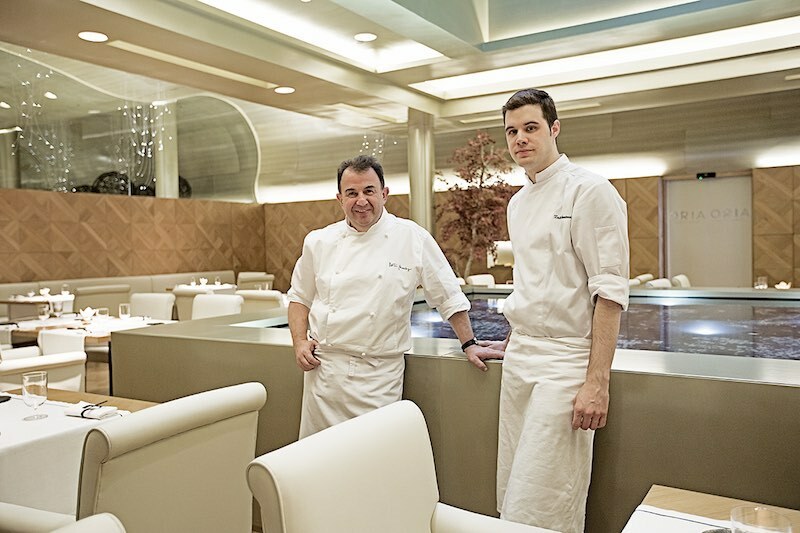 Martín Berasategui and Xabi Goikoetxea at Oria restaurant. “Delicious food, top interior design, very pleasant atmosphere”. “Top service since you step inside the restaurant”. “Excellent dish presentation”… These are just some random reviews you can find on Google by performing a quick search about the newly Michelin Star Awarded Restaurant: Oria, in Barcelona Spain. 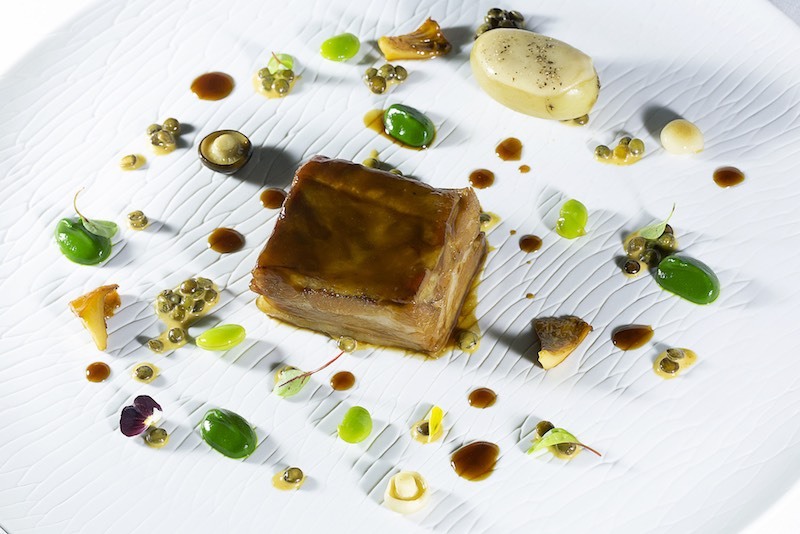 Oria Restaurant represents Martin Berasategui’s 10th Michelin Star. No other chef in the country boasts more Michelin Stars than this chef originary from the Basque Country (Spain’s northern region). Spain & Portugal 2019 Michelin Guide made public its distinctions in a crowded event held back in November at the “Pavilhao Carlos Lopes” in Lisbon. Oria Restaurant, located at the Monument Hotel in Barcelona, ​​under the direction of the Basque chef, obtained its first Michelin Star. Located in the very heart of Passeig de Gracia, Barcelona’s main avenue and most famous high end shopping street, Oria is a modern and sophisticated space integrated into the hotel lobby. The restaurant offers a very fresh signature cuisine with a distinguished nod to the renowned Basque cuisine. Xabi Goikoetxea is the restaurant’s highly talented head chef. The best ingredients in balance with creativity are the hallmarks of Oria’s gastronomic offer, where Martín Berasategui’s cuisine can be enjoyed a la carte or in a customized surprise menu starting at a very decent price of €50. In addition, Oria offers a daily executive menu (Monday to Friday) for only €40, drinks included. Barcelona is a paradise for tourists and locals alike – incredible architecture, art, culture, history, great shopping and delicious food. There is something fabulous on every corner and it is a city that is to be taken in slowly, and enjoyed. When you go to a museum in Barcelona, you expect to see great art and you do see great art. When you shop in Barcelona, you expect great quality and you get great quality. When you drink wine in Barcelona, it should be fabulous. You should have the same high standards when dining in Barcelona. When you eat out in the city, choose the restaurants where you know the experience is going to be outstanding and this can be a pretty easy job in a city that boasts 22 Michelin Star Awarded Restaurants. That makes a total of 31 Michelin Stars. The Michelin Star Restaurants in Barcelona are outstanding. Some Michelin Star Restaurants are so expensive they are almost unaffordable. But there are those that offer good value combined with luxurious and gastronomical delights, and this is the case of Oria Restaurant. The Monument Hotel Barcelona is one of the few hotels with a Michelin Star restaurant in the world. But it still gets more unique, because Monument Hotel boasts not just one restaurant with Michelin stars, but two. The Lasarte Restaurant and the Oria Restaurant. That is something of a gastronomic feat, and this is perhaps why we would suggest you take a look at the hotel. The Lasarte Restaurant has 3 Michelin stars and is completely and utterly sublime. This gives the hotel a total of 4 Michelin stars which is pretty impressive. 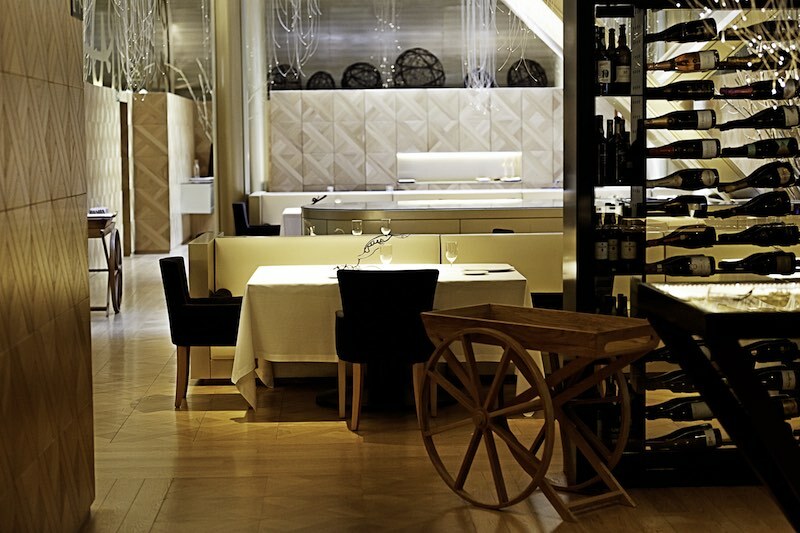 Lasarte restaurant by Martín Berasategui. Barcelona is a sophisticated city; so we think eating at Michelin Star Restaurants Barcelona, or at least in one Michelin Starred Restaurant in Barcelona, is part of the whole Barcelona experience. If you have a few days in the city, explore the local Tapas bars, hang out in coffee shops, try the smaller Spanish bistros. But treat yourself to at least one dinner, in a sophisticated Barcelona Michelin starred restaurant. Make it an evening to remember. We can assure you it will be totally worth it!! Barcelona has so much. Explore, wander, take in the art, the culture and the food. And come back a second time too!